Levira Tallinn: OB and DSNG broadcast services. Tallinn, August 9th 2012: LEVIRA, a leading outside OB and SNG provider in the Baltics, has chosen ERICSSON and RIEDEL to upgrade its DSNG with an innovative 4:2:2 10-bit contribution solution and market leading intercom system. This solution will make LEVIRA the first broadcast service provider in the Baltics to offer a MPEG-4 AVC encoding solution for DSNG services. The upgraded facility was first in use during EURO2012 in Warsaw, Poland. An international feed from the recent WRC Neste Oil Rally Finland in Jyväskylä was also uplinked using Levira’s new facility. 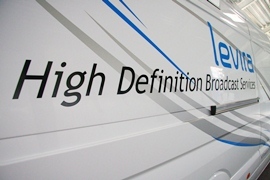 The Ericsson Voyager II Multi-Format DSNG is Ericsson’s fifth generation DSNG and is the most flexible and scalable news gathering product on the market, reflecting Ericsson’s technology leadership and unique heritage in this segment. Voyager II supports the CE-x Series of encoding option modules, a single multi-codec platform enabling the migration to the highest quality MPEG-4 AVC HD 4:2:2 10-bit, while maintaining compatibility with legacy MPEG-2 networks. Riedel Performer 32+16 is a powerful digital intercom matrix/stage management system, which is aligned for the requirements of stand-alone broadcast applications as well as sports and cultural events. The system is based on a modular concept and can be adapted to the individual requirements of the users.